aromLAB from aromKIT offers a fresh and creative way to blend new or favourite aromas, giving you consistent results every single time. Let's face it. Blending scents is bit of a dark art. But if you think of aromLAB as the smell equivalent of Painting-by-Numbers it makes the blending process a lot less intimidating and a lot more fun. Less intimidating because this interactive, graphical app lets you see the shape of the fragrance you are making so you can afford as many mistakes in this virtual lab without wasting good raw materials, and more fun because in the process, you might also discover new aroma blends to match your preference or to suit a particular mood. Step 1. Learn how to identify, classify and determine your favourite scent or scent Preferences. Look up your favourite perfume from an extensive database to set up a scent profile containing your favourite scents. Step 2. 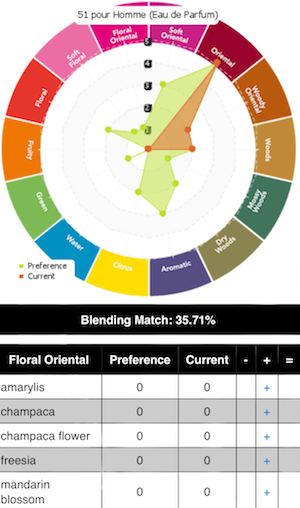 Use the graphical aromLAB tool to add, remove and blend component scents using the aroma wheel to create a profile or recipe to suit a specific mood e.g. Sleep, Lift-Me-Up, Meditation, De-stress. Step 3. Buy aromKIT products containing sets of quality GMCP and GCMS tested essential oils and materials to make room diffusers, candles and sprays at a fraction of the cost of big brands. Just like colours have a reference model, so too do scents. At the heart of aromLAB is the Fragrance Wheel which categorises scents into fragrance families. You start an aroma project by locating your favourite scent components by telling the app what your favourite perfume is. Or alternatively, you can choose from a list of moods. In both cases, a shape of the smell you are trying to blend will be presented as a radar graph - as shown in the pic below - so by adding and removing component scents in a fragrance family, you will literally be able to see how smells take on shape, until both the Red shaded area (the blend you are creating) and the Green shaded area (the profile containing your favourite scents) are identical, indicating a mathematical match. aromLAB is an online tool, developed entirely in PHP by pip. The site template is released under the Creative Commons Attribution license. 2018 © by pip. All rights reserved. | Design by TEMPLATED.